This is another one of those weeks where the Tuesdays With Dorie baking group is doubling up on recipes - after 4 years of weekly baking, the group will finish Dorie Greenspan's book Baking; From My Home to Yours by the end of 2011. I'll no doubt have some reflections in the final post (December 27) but until then I'm not letting myself think about it too much - too sad! Today we have another tart and another recipe for madeleines. 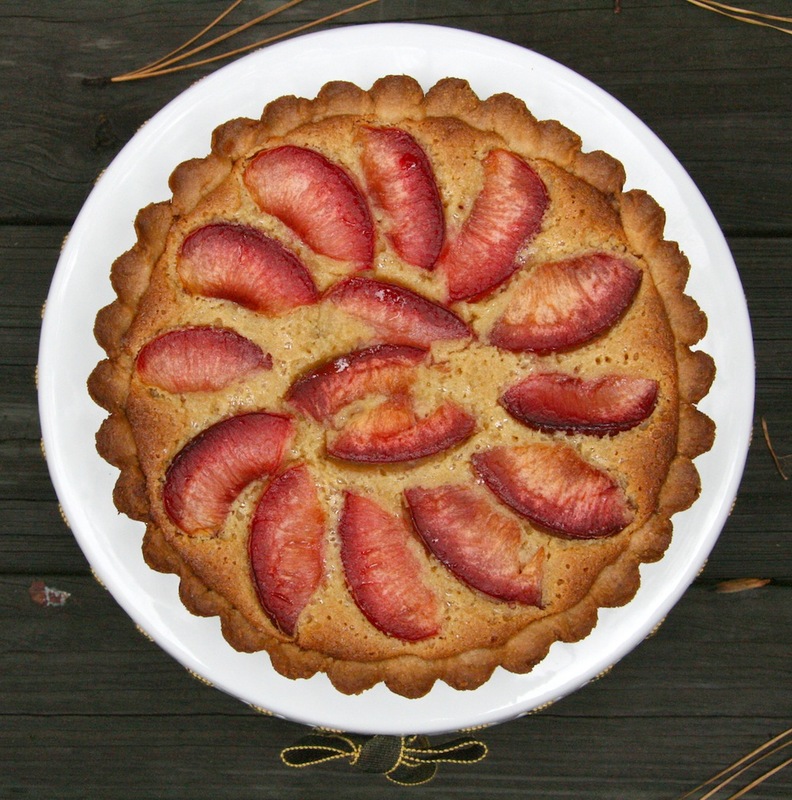 My Honey Almond Pluot Tart hearkens back to autumn while my Russian Tea Madeleines are decidedly wintry, featuring satsuma and grapefruit flavors. Dorie's recipe is for Earl Grey Madeleines, but I have completely run out of Earl Grey tea. I keep running across recipes needing Earl Grey and I have scavenged and scrounged the last of the Earl Grey from the recesses of my tea drawer. Since that drawer is still bursting with other varieties of tea, I am holding out on replacing the Earl Grey. But one byproduct of all that scrounging is that at the very back of the tea drawer I found an unopened tin of Russian tea. As it happens, this tea has orange bergamot oil - just like Earl Grey! - and also tangerine and grapefruit flavors. It sounded perfect for my madeleines. - The madeleine recipe is hosted by Nicole of Bakeologie. You will be able to find the recipe on her cute madeleine post. - Dorie's recipe calls for lemon zest, which is rubbed with the fingertips into granulated sugar before beating both with the eggs, I decided to use satsuma tangerine zest and grapefruit zest to complement the flavors of the Russian tea. - This recipe uses an unusual technique to incorporate the tea: leaves of tea are infused in hot melted butter for 15 minutes. Then the butter is strained and added to the batter, carrying the tea's flavors with it. - Unlike the last time I baked madeleines, I tried to not overfill the molds. They turned out just right, characteristic humps and all, even though I forgot to use Dorie's trick of setting the mold onto a hot baking stone. These were delicious little cookies - crunchy edges, and softer centers, with the citrus and tea flavors adding complexity and holiday cheer. My husband and I enjoyed them with ice cream and a cup of tea, respectively. I love baking tarts. Even if f this group were "Tuesdays With Tarts", and we baked a tart every single week, I don't think I'd get tired of baking - or eating - tarts. This week's tart has plenty of appeal. It started as a fig recipe, but there are many other fruits that Dorie suggests as possible variations on the recipe. - The tart was chosen for TWD by Kayte of Grandma's Kitchen Table (she's a tart fan also). You will be able to find the recipe for the tart and her lovely grapefruit variation if you click to her blog post, but what's even better, you will find her reflections on nearly 4 years of TWD participation. I couldn't say it better. - Earlier in the fall I looked at the remaining TWD recipes and decided to bake all of the ones that needed seasonal autumnal fruit while it was still in stores. At that point I could still find figs but I had just baked a honey fig cake for TWD and decided to branch out to one of Dorie's suggested alternate fruits. I was hoping for apricots or nectarines but there were none to be found so I picked up some pluots. They're half apricot so I deemed them "close enough." - For the tart's crust, I made Dorie's Sweet Tart Dough with Nuts, using Bob's Red Mill Almond Flour. I love that tart dough recipe and thought the almond would complement the almond filling. Also, I managed to run out of flour so it was fortuitous to replace some of the recipe's quantity of flour with ground nuts. - I added almond extract to highlight the almond flavor of the filling. This was a lovely tart, accompanied nicely by a scoop of vanilla ice cream. The brightness of the pluots was a counterpoint to the sweet creamy almond filling. All in all, two more delicious recipes, and just three more remain until the book is finished! Your mads are beautiful. The tart is also gorgeous with those colors, I must try that version as I love those. You are right, I am a tart fan and I would certainly join a Tuesdays with Tarts group...as long as you are referring to the baked kind and not the wild woman kind (well, I might join that group as well actually...lol, just kidding). I love making tarts more than any other baked goods. I love my 6" tart pan the best of all. Thanks for baking this recipe with me this week (even though I remember when you made it and it wasn't this week because you are just that organized!) and wow that you did the mads as well. Thank you for your kind words about my post as well. What spectacular photos, Nancy! I haven't baked either of these yet, but I'm kind of happy about that since I just pocked up so many great tips! I love the flavors you went with for the mads, and regret I wasn't thinking ahead while there was still abundant summer fruit in the stores. Even after our conversation yesterday, I still didn't bake either recipe this week. But like Leslie, I figure I'll absorb all of the good advice this week and bookmark both recipes for another day :) Both of your treats look phenomenal!! Both look wonderful, as usual! I did not get to the tart, as I was short on time and I figured I would not be able to find figs (I actually did see them tonight, though from Mexico). It seems to be getting great reviews, so hopefully I'll get to it. I used cranberry orange tea in my madeleines and it was very seasonal. I made the tart with pears and I loved this tart. I can't wait to make it again. Wow you coordinated your citrus and your decor with your tea flavor! Way to go thats dedication for sure. I love those little dolls! Your tart looks delicious too. Wow, they both look fantastic! Such perfect madeleines. I wish I'd have made the fig recipes while they figs were available. I do love them but I'm guessing there's not a fig in the whole state right now, lol. Anyway, nice work. Both your tart and mads look spectacular! The key to the mads is definitely not to overfill the moulds - it's amazing how much they spread. It's like a dessert extravaganza in your home! Both of those look so elegant and delicious!